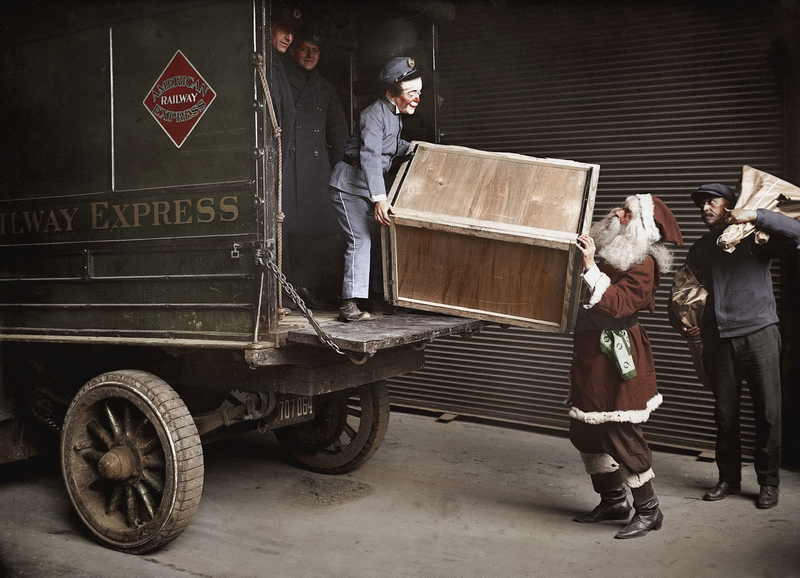 Many years ago Railway Express Agency was the way to ship express parcels. Its heritage traces back to the railroad industry's earliest years although the modern REA was not formed until the late 1920's. In time, it expanded rapidly with thousands of small offices located in every corner of America while its headquarters was based in New York City. Folks came to depend greatly on REA for their shipping needs. With its trademark red-diamond sign, green delivery trucks, baggage carts, and railroad equipment REA was a common sight across communities large and small. It was the UPS or FedEx of its day. Alas, things crumbled after World War II which coincided with a rapid decline in rail travel. Express shipments had always been handled as head-end traffic and railroads grew increasingly disinterested in subsidizing a business model losing ever-more money. Ultimately, REA failed in the 1970's and was liquidated. Today, the Railway Express Agency is only a memory although it will long be remembered as one of America's great institutions. The REA was not actually a railroad although it held very close ties to the industry. According to the book, "Ten Turtles To Tucumcari: A Personal History Of The Railway Express" by Klink Garrett and Toby Smith, the Railway Express Agency was a non-profit corporation owned by several railroads, all of which held various levels of stock in the company. The REA's boardroom was located in New York with the largest shareholders gaining a seat on the board. From here, new REA presidents were voted in along with discussions pertaining to the company's direction and affairs. Until about the mid-20th century REA provided a tremendous service since it acted as a third party in handling all express shipments which the railroads would otherwise have to deal with themselves. If one paid attention to passenger trains in those times at the head-end of almost any consist would be at least one car (usually a baggage) carrying a "Railway Express Agency" stencil. REA handled more than just door-to-door deliveries. It also expanded into international shipments and even once owned an express air service. It is said the express business originated around Boston, Massachusetts in 1835. The earliest ancestry of what eventually became the Railway Express Agency was launched by William Harnden a few years later. In a classic case of supply and demand, Harnden's idea arose from what he perceived as an unfilled public need. His journey also began in Boston when he made a delivery of mail and packages to New York City during March of 1839. It is believed that this express shipment was the first to utilize a railroad at least part of the way (a direct New York - Boston rail line was not yet in service then). As business grew he formed Harnden's First Express and even initiated shipments by steamboat. In 1845, following his death, the business was merged with Adams Express as a new industry rapidly took off. Its growth was sparked partially by the expanding railroads, which could complete trips at previously unheard of speeds. What once took days or weeks could now be accomplished in mere hours. Names like Wells Fargo (Still in business today, it was launched by Henry Wells, who had once worked for Harnden; he was later joined by William Fargo. ), American Express, United States Express, Southern Express, Pony Express, and others were all doing business by the Civil War. These companies began consolidating after the conflict until by century's end just five remained; Adams Express, American Express, Pacific Express, Southern Express, United States Express, and Wells Fargo. Due to public complaints the Interstate Commerce Commission, governing regulatory body of the railroad industry since early 1887, was given extended powers to oversee the express business on February 1, 1914. The direct ancestry to Railway Express was actually the government itself. When the United States Railway Administration nationalized the railroads during World War I it did the same for express services, creating the American Railway Express Company on June 30, 1918. This coincided with the introduction of motorized trucks to speed up deliveries. In March of 1920, Congress passed the Transportation Act (specifically known as the Esch–Cummins Act) which was subsequently signed into law by President Woodrow Wilson. It was made effective on March 1st and is largely remembered for returning the railroads to private control. However, a less conspicuous aspect of this act also made American Railway Express a private corporation. One of its first tasks was to adopt a new livery, deciding on a deep green and red scheme in 1921. The ARE tenure as an independent company was short-lived. With the "Roarin' 20's" witnessing unprecedented economic growth for the railroads they deemed it worthy to hold stakes in the express business. 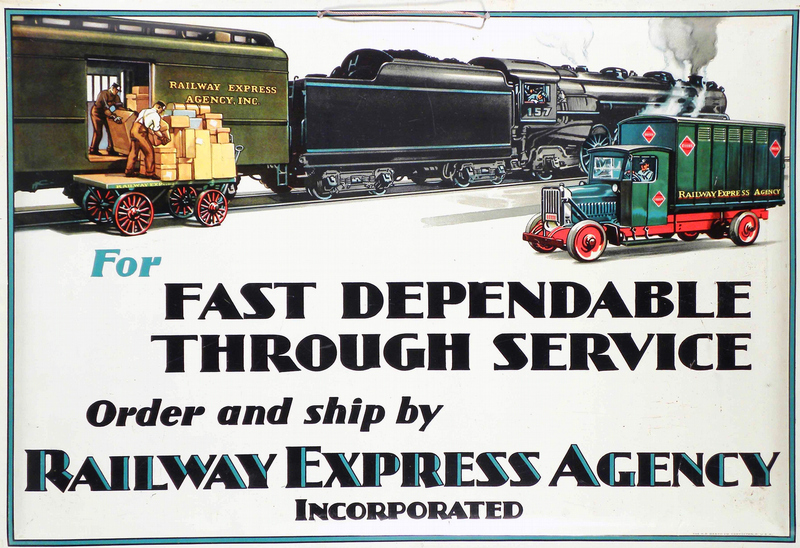 On December 7, 1928 a new company was formed known as Railway Express Agency, Inc. to acquire ARE with which the railroads opened contracts on February 28, 1929. For any railroad wanting stakes in the new operation it had to purchase at least one share of stock totaling 1,000 shares. In all, 86 Class I's bought a controlling interest. Soon after its creation, REA, which retained the Christmas colors of red and green, debuted the now-classic red-diamond logo within which was displayed "Railway Express Agency." This iconic emblem remained unchanged during the next four decades. The largest shareholders of Railway Express Agency. The Railway Express Agency, Inc. In short order, REA was doing big business as it purchased new trucks, hired more employees, and expanded service across the nation. Almost any town which contained a train depot also had an REA office. In many out-of--the-way places a single expressman served the entire community while a large city like New York (which handled one-quarter of all REA business alone) staffed hundreds. Rural expressman performed their duties with a little delivery truck, which became a common sight across the country. Its design would inspire today's big brown trucks operated by United Parcel Service. The vehicle was painted deep green with an REA logo or the company named adorning the side. 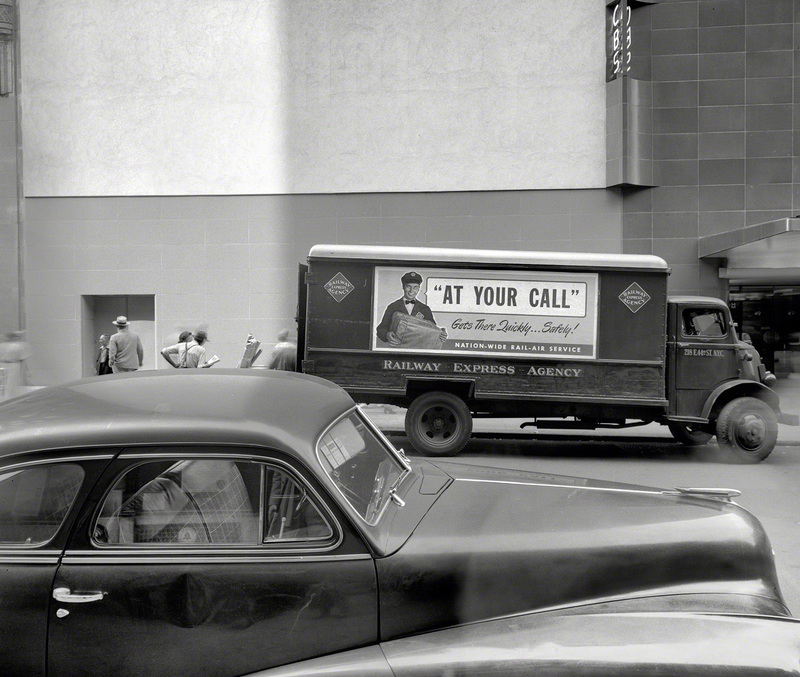 In addition, there was often a large advertisement displayed behind the cab. These ad contracts usually featured big-name corporations such as cigarette or chewing gum companies. They were changed on a monthly basis. Above all-else expressmen were reminded again and again to provide the absolute best in customer service. While packages could be brought straight to the depot it was not uncommon for REA to drive out and pick up a shipment directly from a customer's property. Unlike today, customer service then was of the highest priority. The REA guaranteed a delivery, anywhere in the country, within five days and went to great lengths to ensure this promise. If one was shipping out of the States transit times were usually a bit longer due to customs and the uncertainty of another country's delivery system. Shipments always carried two labels to ward off potential lost addresses and the company would transport virtually anything, regardless of size or oddity. At its peak Railway Express operated in the typical top-down approach with a board of directors (the railroads), a president, vice-president, and so-forth. From its headquarters at 219 East 42nd Street in Manhattan (dating to 1905), REA handled nationwide business within four sectors; Northeastern, Southeastern, Central, and Pacific with a vice-president presiding over each. While the company didn't get to keep any of its earnings it did have an exclusive setup as the sole express rail service. In addition, railroads provided all shipping and terminal space at no cost which provided REA with the perfect business model. Of course, this bred a lackadaisical approach towards spending and the brewing issue of ever-growing deficits. 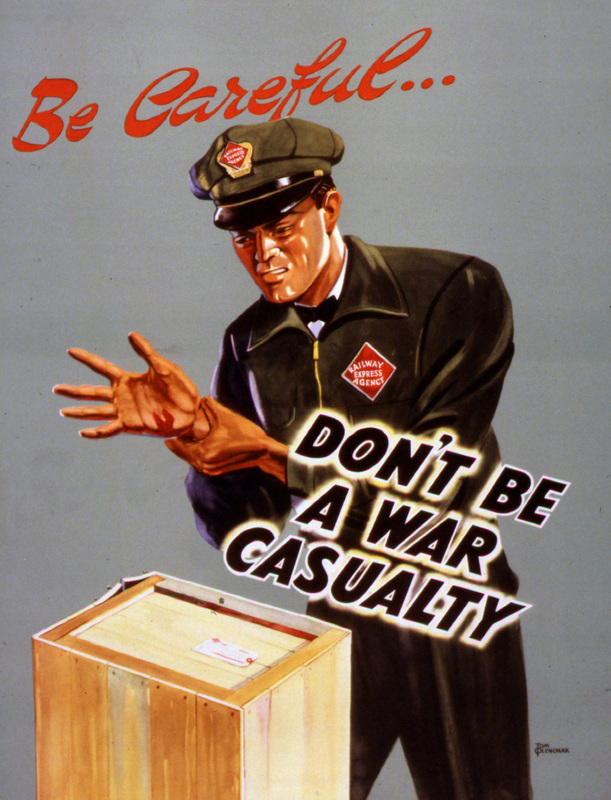 Outside of personal shipments REA also handled regular freight including hazardous materials and explosives. Other freight included fruits and vegetables, time-sensitive autoparts, general merchandise, animals and even circus materials. On September 1, 1927 the company launched air service, and later organized a subsidiary known as Air Express. It eventually won a contract with eighteen different airlines to handle its shipments. At first it was successful but as competition grew, business slowed. When railroads signed the original contract it stipulated they would honor their pledge in subsidizing and handling REA shipments until February 28, 1954. At that time a new contract was drawn up for twenty more years. In a foreboding sign just 60 of the original 86 railroads agreed to the extension. As owners they were responsible for all incurred debt and, unfortunately, REA was not a profitable venture. Competitors like Federal Express and UPS were beginning to make serious inroads into REA's business. The government's own U.S. Postal was also slicing away customers along with other forms of transportation. In 1946 Railway Express carried an operating revenue of $427 million. This number had dropped to $315 million five years later. Even as early as 1945 it was posting annual deficits of nearly $100 million. Seeing the bleakness of it all, the agency's biggest shareholder, New York Central wanted out and sold its stakes in January of 1960. According to its president, Al Perlman, REA was simply an outdated mode of transportation. Railroads were facing a similar problem as the passenger business itself was in a tailspin. In November of that year Railway Express adopted a new working name as "REA Express." The company retained its original corporate title with the purpose meant to distance itself from the railroad industry. Alas, try as it might nothing worked, including an attempted expansion into the growing air express business. The swiftness of REA's collapse is staggering even in comparison to rail travel. Ironically, new leadership under Bill Johnson witnessed Railway Express earning its first ever profit in 1962. A meager but respectable $4 million was achieved that year, primarily through cost-cutting measures. A few years later, however, Johnson left to become president of Illinois Central. In 1968 Railway Express became a private, for-profit company when Spencer Moseley and a group of associates acquired its assets for $2.5 million. The railroads were officially out of the express business. That same year it lost $15 million. In the summer of 1969 its name was changed permanently to "REA Express, Inc." and a new logo featuring an upward pointing arrow at a 45-degree angle. In addition, trucks and railcars now carried a red diamond emblem with "REA" and a large white "X." REA's final decade was a sad one. Well over half of its business derived directly from trucking and it expanded upon this by purchasing new vehicles. On May 1, 1971 Amtrak, a quasi-government agency, took over most intercity passenger services. Then, only around 5% of REA's business still moved by rail. It seems that given the company's remaining assets, its heritage, and the right leadership it could have reinvented itself. A similar situation occurred at computer technology and IT consulting giant IBM. With a history tracing back to the 1880's, the IBM of today was formed in 1924 producing mechanical devices ranging from job recorders to time stamps. It then moved into computers, introducing the first large-scale calculating machine in 1944. In 1975 it produced one of the first computers to fit on a desk (5100 Portable Computer) and in 1981 introduced the IBM Personal Computer. This contraption featured a computer unit, monitor, and keyboard with which many of us are so familiar today. As competitors like Microsoft, Hewlett-Packard, and Apple provided stiff competition during the 1990's IBM was on the verge of collapse. It then branched out into IT and consulting, hosting services, and related areas. This move paid big dividends and the company remains successful today. REA seemingly lost its way after abandoning the railroads. Things spiraled quickly through the 1970's as business declined by about 50%. In a blink of an eye it was all over. In 1975 REA Express, Inc. entered Chapter 11 bankruptcy proceedings and its assets were ordered liquidated. In 1979 it sold its operating rights across the country and the final chapter had been written in the company's storied history. Today, its legacy lives on in the remaining signs, vehicles, rail cars, paper items, and other pieces which survive still bearing its name. In addition, UPS delivery trucks continue carrying the same basic design as their REA predecessors. Finally, the Agency's heritage survives in other ways; it was the first to offer such shipping perks as insurance, pickup service, and guaranteed arrival times. Today, these are commonplace throughout the industry. It is a shame so little has been written about one of America's pioneering corporations. Aside from Mr. Garrett's and Mr. Smith's book the only other piece published since 1990 was V.S. Roseman's, "Railway Express: An Overview," released in 1992. Both books provide the most in-depth history of REA available.